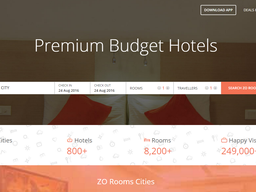 Everyone loves affordable accommodation, and one company helping people easily find budget hotels easy is ZO Rooms. If you're looking to make even more savings on your rooms, you've come to the right place, because here at DealSunny we have the largest and most up to date collection of ZO Rooms coupons and offers on the web. Never waste your time on the search engines looking for a coupon or deal that actual works again. Just scan down our list and when you see an offer you'd like to redeem, clicking the link will open a page with all the terms and details on how to use it on the ZORooms.com website or mobile apps. Now you never have to pay full price again when you book a budget hotel room again! Don't need a hotel room today? Then be sure to check out the full DealSunny database. We collect the latest offers for most popular Indian online stores, service providers and even food delivery apps. This includes coupons, cash back and info on all the latest sales! 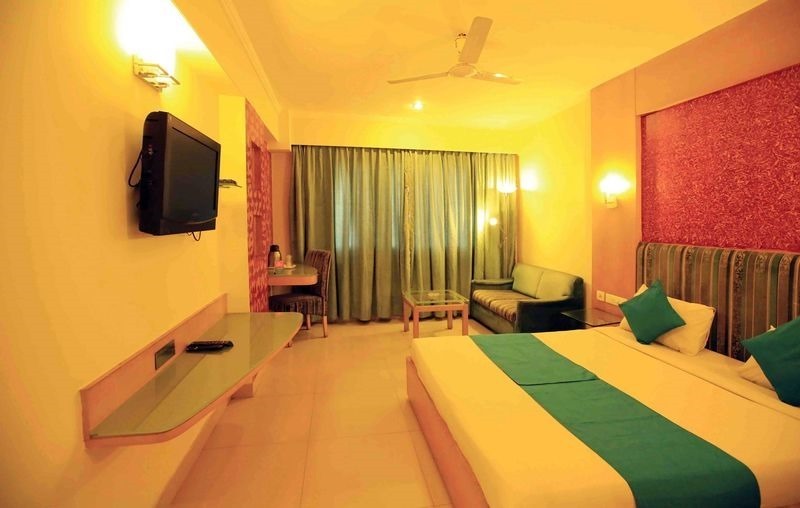 ZO Rooms is a leading platform for finding and booking affordable hotel rooms in India. The privately held company is based out of Delhi, and aggregates rooms from quality hotels across the country as well as owning over 200 hotels of their own which are included in the search. Users can go to the main ZORooms.com website to book their rooms or use the mobile app for Android and iOS devices, which can be download from the Apple App Store and Google Play Store respectively. As well as allowing customers find some of the best deals on hotels in India, the company also provides further savings through the redemption of special offers. These are commonly found in the form of ZO Rooms coupons, and you can find all the latest coupons right here at DealSunny. Before you make a booking it is therefore a good idea to check back to this page first, to ensure you get the best deal possible. ZO Rooms was founded in 2014 as an offshoot of upstart Zostel Hospitality Pvt. Ltd, which was launched the previous year by Akhil Malik, Dharmveer Singh Chouhan, Paavan Nanda, Tarun Tiwari, Chetan Singh Chauhan, Abhishek Bhutra, and SiddharthJanghu. They saw a gap in the market for a streamlined online hotel booking platform that aggregated the most affordable options, but quickly expanded by introducing their own hotels as well. They currently have plans for 1000 plus hotels across 50 cities. Because of this other aggregators and travel companies have de-listed them in an effort to prevent them gaining market share. "ZO Rooms is ‘Reinventing hospitality’ by providing travellers with friendly, affordable, secure and reliable rooms. The cities may vary, but your experience with us will be the same. And that’s a promise," reads their about page. ZO Rooms is on hand 24/7 and their own hotels cover all basic amenities, such as breakfast, stable free Wi-fi, and much more. ZO Rooms allows users to book affordable hotels in all major cities across India, by aggregating some of the best third party hotels and including 200 plus of their own in the database. In total there are over 800 hotels to choose from, with 8,200 rooms, across 54 cities. These include: Agra, Ahmedabad, Allahabad, Baddi, Bangalore, Bhilwara, Bhopal, Bhubaneswar, Chandigarh, Chennai, Daman, Delhi, Faridabad, Ghaziabad, Greater Noida, Gurgaon, Haridwar, Hyderabad, Indore, Jaipur, Jaisalmer, Jodhpur, Kanpur, Kasauli, Kasol, Kolkata, Kullu, Lonavala, Manali, Mount Abu, Mumbai, Mysore, Noida, Pondicherry, Pune, Puri, Pushkar, Rajkot, Rishikesh, Rourkela, Shimla, Siliguri, Udaipur, Vadodara, and Varanasi. If you wish to redeem a ZO Rooms promo code, make sure to choose the best one for your booking. Some for example may be applicable for all hotels, while other may offer deeper savings for ZO Rooms' own hotels, or certain locations only. Furthermore only one code can be used per booking and will usually have an expiry date, so make sure you jump at the chance to get the discount! All of ZO Rooms' own hotels (currently over 200) include high quality beds, 24/7 service and manned desk, free stable Wi-Fi in your room, LCD TV, 24 hour hot water, personal locker and key, breakfast, security on hand, a doctor on call, and your choice of single, twin and double rooms; as well as up to 4 people per room. There will also usually be a cafe and/or a restaurant downstairs, for snacks, meals and refreshments, and a laundry service for an extra fee. Pricing begins at just Rs.999 and will not go any higher than Rs. 3,999 per room.Standard check in is 12pm or after, and checkout should be before 10am. In an effort to provide the most affordable hotel rooms in India, ZO Rooms gives users the opportunity to save on bookings through the redemption of special offers. Specific deals are always changing, so be sure to check back to DealSunny for an up to date list, but here is a general idea of what you'll find over time. Regular Discounts: From time to time they will discount the price of select hotels, rooms or locations, but be fast before the offer runs out. For regular discounts all you have to do is book the room to benefit from savings. New User Deal: If it is your first time booking a hotel through ZO Rooms you will usually be given an introductory offer, such as Rs. 100 off. ZO Rooms Coupons: These are special codes that allow you to claim various discounts and deals. You enter the code (only one per booking) during the online checkout process. App Exclusives: From time to time the company will reward app users with exclusive discounts that aren't found on the main website. So if you have an iOS or Android device, there's no reason not to download it and benefit from the savings. As well as checking back to DealSunny to find the latest offers you can also sign up to their email newsletter, which will occasionally send out exclusive deals as well. You might also want to follow them on social media, such as Facebook and Twitter, where they may also send out some exclusive offers. At ZO Rooms you have the option to pay online or in cash when you arrive at the hotel with your confirmation information. If paying online you can use most commonly issued credit and debit cards in India, including Visa, American Express, Mastercard, Visa Debit, Maestro, and Diner's Club. This can be done via their secure online gateway or through various mobile wallets through their mobile app. If you wish to redeem a ZO Rooms promo code, you must do so just before the payment step. All you need to do is enter it in to the special box, and if still in date you will see a confirmation message. The cost of your booking will then decrease according to the terms of the coupon. Only one can be used per booking, so make sure it's the one that gets you the most savings. Depending on your preferences when registering, you will receive confirmation of your hotel booking via email and/or SMS. You should print this off or at least save the number, and present this when you check-in. If paying by card you will also need to bring it with you for verification. You can cancel or change your room booking by calling the company on +91-9015-333-888. If you cancel 7 days in advance of the check-in day you will receive a 75% refund. If the booking is less than 7 days away you will only get half back. If you cancel within 24 hours or miss the booking entirely you will receive no refund. Obviously if you have used a ZO Rooms coupon code to get a discount, this portion of the bill will not be included in the refund either. To book rooms all you have to do is visit the website or use the app and select a city from the dropdown menu. You can then enter the Check In and Check Out date, number of rooms required, and number of people using the booking. Then simply hit the search button and all of the available hotels based on this information will be displayed. You will see an overview and price of each, and you click each one for a more detailed description, list of facilities and more. Hit the Book button if this is the hotel/room you want, and you will be taken to checkout. Just before the payment step you can redeem any ZO Rooms coupons and offers via coupon code. Before completing a booking you will need to register an account with your personal details. These will then be saved for future use, making bookings easier and faster. @ShutupShakalya We truly regret this. @ShutupShakalya We apologise for the incident. Please share your booking id and we shall look into it urgently. @Zwackleby @MyHyness We are arranging for a call back, urgently! @Zwackleby Do give us sometime to look into the matter.